We currently operate a low vision clinic to help those of you with poor sight. You do not have to be registered as sight impaired but you must have an amount of sight loss which affects your daily living. Accredited optometrists such as ourselves will undertake an assessment to determine if any low vision aids are available to help a person with low vision do the things they want. The appointment with the low vision practitioner is provided free of charge by the NHS and all the low vision aids are available on loan, and free of charge. Our Optometrists will also use their knowledge of other low vision services in the area to advise you of further help that may be available. To have a low vision assessment you can refer yourself to an accredited practitioner or be referred by any of the following: a GP or family doctor, an optometrist, social services, community services, or an ophthalmologist in the hospital eye service. Once you have been referred we should be able to offer you an appointment within one or two weeks. One of our optometrists will carry out a tailored eye examination, and will assess how vision aids and appliances may be able to help you. The whole process usually takes about 30 minutes, although this may vary according to your individual needs. There will be no charge for the assessment or for any equipment issued. The Low Vision Service is funded by the local CCG. The scheme provides all aids and appliances on a loan basis. We will contact you by telephone after four weeks to find out if you are using the appliance we have provided successfully. At this point an appointment can be made for re-assessment if you are having any difficulties. We will contact you again six months later for an appointment to check again and supply you with a different aid if needed. If, for any reason, you decide not to use the aids, they should be returned to the optometrist who supplied them. Unfortunately, as our eyes get older they need more light to be able to see clearly and to read in more comfort. This is an unavoidable consequence of the natural ageing process of the human eye. Serious Readers, for many years have been designing reading lights that enable people to read in a way that they took for granted when they were younger. 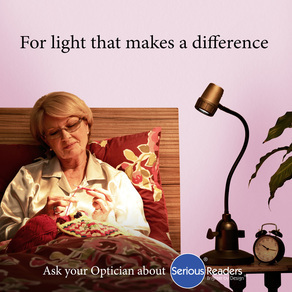 You'll be amazed at the difference a proper reading light can make! Of course the lights can also be used for any hobbies where you're putting a strain on your eyes such as needlecraft, stamp collecting or jigsaw puzzles. Serious Readers been designing and building lights that help people read and work in more comfort for over 20 years, originally for businesses such as clothing manufacturers where employees were putting their eyes under considerable strain. They've even built lights used in tough conditions like on board lifeboats and the space shuttle. Over the last 4 years the original lighting technology has been adapted, modified and improved to create a range of reading lights for people to use in their own home.